GSU officers in Kinango, Kwale disrupt an opposition rally following orders from "ABOVE". - Bana Kenya News, Real African Network Tubanane. Home Mombasa GSU officers in Kinango, Kwale disrupt an opposition rally following orders from "ABOVE". GSU officers in Kinango, Kwale disrupt an opposition rally following orders from "ABOVE". 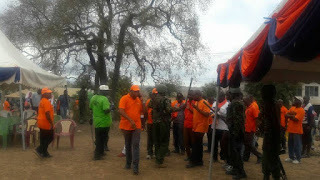 The GSU from Kwale county in addition to others from Mombasa disrupts an ODM rally at Kinango and Lunga Lunga in Kwale. The GSU said they were following orders from above. The GSU lorries had more than a hundred officers who were sent to disperse the rally in Kwale. The rally was expected to be led by the Mombasa Governor Hassan Joho.The opposition supporters demand more explanation from the county Governor Salim Mvurya following the incidence. Some opposition members arrived at the scene and were shocked to find seats and tables turned down. Hon Dor and Hon Mwapojo were demanding answers from the police as the situation was under control. "The Government has decided to block all opposition rallies at the coast which feature the Mombasa Governor Hassan Joho." said the Kisauni MP Rashid Benzimba. It is speculated that the orders came from the state. The president Uhuru Kenyatta told Governor Joho that he will show him. According to the opposition, the President has started working on Governor Joho and aimed to silence him. The Mvita MP AbdulSwamad Nassir said that the Government is playing cheap politics by using excessive force to disrupt the opposition rallies at the coast.